WHO ARE THE SEMINOLE PEOPLE? The Seminole people are the descendants of the Creek people, and the Creek people are the descendants of the Lamar peoples. The ancestral lands of both the Lamar and Creek cultures encompassed parts of Alabama, Georgia, Florida, North and South Carolina, and Tennessee. The Lamar period lasted from about 1350 until 1700. The descendants of the Lamar peoples became the historic nations known as the Creeks and Cherokees. The Creek Nation was created through a gradual process of assimilation that continued into historic times. The nation was a confederation of dozens of towns, reflected in the fact that its members spoke seven languages: Muscogee, Hitchiti, Koasati, Alabama, Natchez, Yuchi and Shawnee. The first five are dialects of Muskogean. Remnants of the Westo (Yuchi), Apalachee and Yemassee Tribes were absorbed after their defeats by the English. At the beginning of the sixteenth century, the Spanish attempted to set up a system of missions across north Florida and southern Georgia. While these efforts to set up missions in the Creek country failed, there were Creeks that were drawn from Georgia down to the Spanish missions in Florida. These included the Oconee at San Francisco De Oconi (1659); the Sawokali at Encarnacion de Sabacola el Minor (1675); and the Tamathli at Nuestra Senora de la Candelaria de la Tama (1675). Also in Florida at this time were other native peoples that would later be incorporated into the Seminole tribe. They included the Apalachicola who were settled along the river of the same name; the Yemassee, at San Antonio Anacape (1681), and Nuestra Senora de la Candelaria de la Tama (1675); the Tawasa, of the Timuqua; and the Yuchi, who were at this time located between the Apalachicola River and the Choctawhatchee Bay area. The nucleus of the Seminole Nation however, was to form around a settlement of Oconee, Chiaha, Apalachicola and Sawokali town members. They came to prominence as allies of the English General Oglethorpe in his attack on St. Augustine in 1740. Afterwards they established a settlement at Cuscowilla (present day Micanopy, Florida) where they flourished as cattlemen. Their first leader, appropriately known as the Cowkeeper (an Oconee), was a sworn enemy of the Spanish. Throughout his life he kept both the Spanish and English out of what he considered to be the Seminole Nation, essentially all of the land west of the St. Johns River. The people of Cuscowilla Town were Miccosukee speakers. The first Creek speaking people settled at Chocuchattee (Red House) sometime around 1760 near present day Brooksville, Florida. Like their Mikasuki speaking neighbors, they were also cattlemen. Soon the vast herds of the growing Seminole Nation drew the attention of their white neighbors to the north. Conflicts that were occurring in Georgia spilled into Florida due to an increased white desire for land and cattle. The story of Cowkeeper and his family is typical of what occurred to many Seminoles for the next one hundred years. Cowkeeper’s nephew was Payne. Payne’s nephew was Micanopy, and Micanopy’s nephew was Billy Bowlegs. Cowkeeper would kill eighty-six Spaniards before he died in 1784, and was recorded as saying that his only regret was in not having killed a hundred. 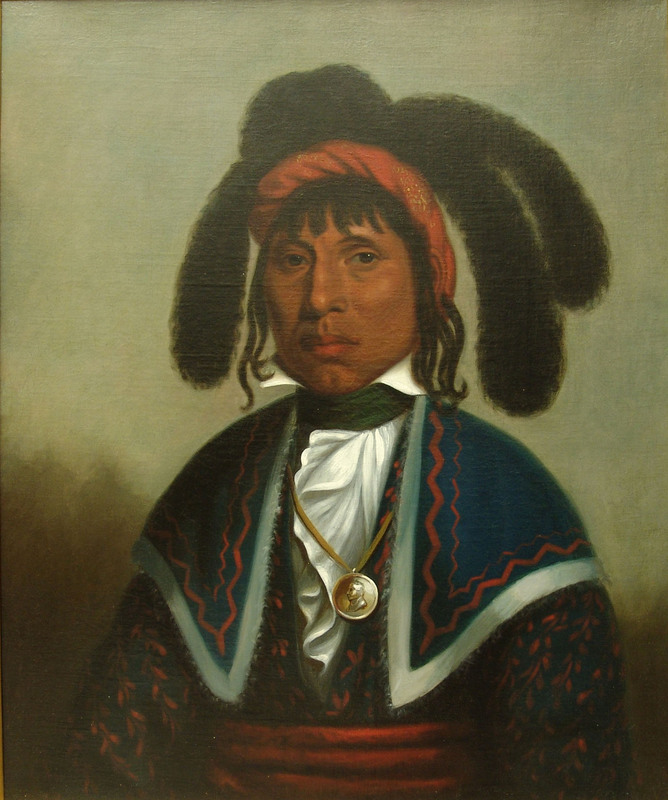 Payne would die in 1813 of wounds he received defending the Seminole lands against a band of Georgia cattle thieves. Micanopy would be forced to go west to Oklahoma during the Second Seminole War (1835-1842). Billy Bowlegs would survive the Second Seminole War only to be sent west at the end of the Third Seminole War (1858). He died of yellow fever during the Civil war while serving as a Major in the Union Army. In four generations, the only one of these men who died peacefully at his Florida home had to kill eighty-six people to do it. The Seminole population in Florida remained fairly small, around 1200, compared to the main body of Creeks in Georgia and Alabama, who numbered possibly 25,000 people. Though the War of 1812 is thought of as a war between the U.S. and Britain, it was a fierce Indian war as well. Native peoples dissatisfied with the increasingly aggressive actions of their white neighbors and the state governments joined the British against the Unites States armies. The following fifty year period of warfare has been divided by historians into the War of 1812 (1812-1815); the Creek War (1813-1814); the Creek Civil War (1813); the First Seminole War (1818-1819); the Second Seminole War (1835-1842); the Scare of 1849-50 (1849-1850); and the Third Seminole War (1855-1858). It is unlikely that anyone there at the time saw the difference. In reality, all of these conflicts were one long war against the Creeks. A great resource on the Seminole Wars can be found on the Florida Department of State, Division of Historical Resources website. One result of these battles was that by 1823 the native population had increased three or four fold by refugees of the wars. This population of about five thousand was thrown together and subjected to the fiercest of all the wars ever waged by the U.S. Government against native peoples, known as the Second Seminole War, 1835-1842. This seven year war cost more than the American Revolution (estimates start at $20,000.00) and involved fifty-two thousand soldiers fighting against less than two thousand warriors: by the end of the war there were reportedly only three hundred Seminoles left in the territory. Despite such a small number of Seminoles remaining, the US government and the state of Florida continued Indian removal efforts, offering money for any individuals who chose to move west, as well as reimbursement for properties left behind, though few Seminoles accepted the offer. The result was another increase in tensions as the Army continued to move troops into the area, culminating with Billy Bowleg’s attack on Lt. Hartsuff in the Big Cypress Swamp in 1855, and the war lasted another three years and led to the removal of around 200 more individuals to Oklahoma, namely those of Billy Bowlegs’ and Assinawah’s bands. No one really knows how many Seminoles were left in Florida after the 3rd Seminole War ended in 1858, though in 1887 Special Indian Agent A.M. Wilson recorded that there were sixty adult males in a Florida Seminole population that totaled two hundred and sixty-nine men, women and children. For the next sixty years the small population of Seminoles would live on the fringes of society. They made livings as hunters, guides and curiosities for the tourists. Outside of a few anthropological reports written by people like Clay MacCauley and Captain R.H. Pratt, knowledge of the Seminoles from 1860 until 1930 is relatively sparse. In 1907, the Department of the Interior set aside 540 acres of land near Dania for Seminole use. In 1911, President Taft set aside lands in Martin, Broward and Hendry Counties as reservation. By 1913 there were 18 Indian reservations in Florida, ranging in size from 40 acres to 16, 000 acres. The Seminoles themselves resisted life on reservations. Native people were simply adverse to the concept of land ownership, and combined with a migratory seasonal lifestyle, reservation life was initially a hard sell. The Seminoles in the only camp on any of the reservations (Billy Fewell’s camp) probably didn’t even know that they were on reservation lands. The Seminole Indians have not been at war with the United States for one hundred years. The Seminole Indians live in peace and happiness in the Everglades, and have pleasant relations with the United States government. The Seminole Indians want a better understanding with the United States government and want to hear no more about war. We have learned from our forefathers about the losses of our people in the Seminole War, and during recent years have witnessed the coming of the white man into the last remnant of our homeland. We have seen them drain our lakes and waterways, cultivate our fields, harvest our forests, kill our game, and take possession of our hunting grounds and homes. We have found that it grows more and more difficult to provide food and clothing for our wives and children. We request and petition you to use your influence with Congress and the President of the United States to obtain for us the following lands and benefits. The Seminole delegation concluded their address to Mr. Ickes with requests that included setting aside lands in the vicinity of the present day Brighton and Big Cypress reservations for the use of the Indians. It also asked for allowances for lands that had been taken from them, and medical assistance. This “talk” was far from submissive in nature. The biggest concession that the Tribe was willing to make was that they were no longer at war with the Government. The reservation question divided the Florida native peoples into two camps. One group would become known as the Miccosukee Tribe of Seminole Indians of Florida; they were located next to the newly created Everglades National Park, effectively putting the area out of the reach of developers. The area provided, albeit imperfectly, a safe haven for people who held traditional views. The second group, the Seminole Tribe of Florida, took the offer of the reservation lands and began a new way to sustain the Seminole culture. They used the reservations as preservation areas in which to maintain the customs, language and self-government of the Tribe. It provided a permanent and secure answer to the problem of the growing non-native population. There were many issues that led to the decisions made by leaders at the time. These included health care, education, Christianization of tribal members, the re-establishment of the tribal cattle industry, and so on. The reservations, more or less as they exist today, were established at the end of the Great Depression. A New Deal program, the Civilian Conservation Corps, had a special section, the Indian Department, or CCC-ID, that went to work helping to establish basic needs on the reservations, including training tribal members to become skilled in range improvement, water control, digging wells, fencing, operating heavy equipment and constructing windmills. Most of these skills relate to the cattle industry, so it seems appropriate that the first elected officials of the reservations were the committee members of the Brighton Agricultural and Livestock Enterprise and the Big Cypress Agricultural and Livestock Enterprise organizations. 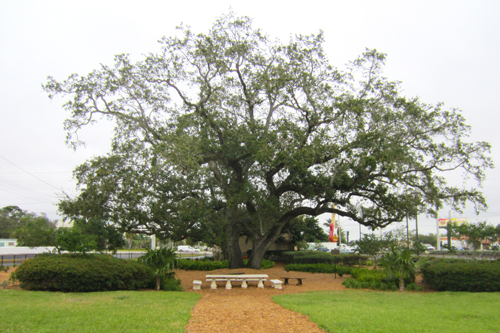 The Council Oak was the backdrop for the signing of the Tribal Constitution. It can still be seen today on the Hollywood Reservation. 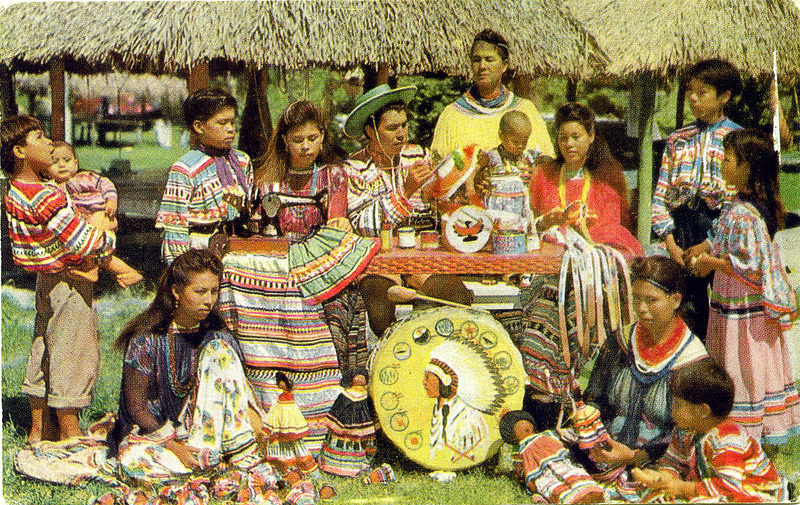 The 1950’s were a turning point in the history of the Florida Seminole people. In 1953, the United States Congress passed legislation to terminate federal tribal programs. Tribal members and their supporters were able to successfully argue against termination and by 1957 had drafted a Tribal constitution. They attained self-government through the formation of a governing body, the Tribal Council. At the same time, the Seminole Tribe of Florida, Inc. was created to oversee the business matters of the Tribe. During the 1970’s the Tribe began a project that would affect tribal people all across America - Tribal Gaming. Beginning in a bingo hall on the Dania Reservation, Indian gaming today is the mainstay of many tribal economies across the country. Today the Seminole Casinos support a growing infrastructure for the Seminole community’s health and welfare, public safety, education and other services. The economic stability provided by gaming, combined with the cattle, citrus, and other business enterprises, has made the Seminole Tribe of Florida one of the most successful native business peoples in the United States today. It has also provided them the resources to preserve their culture through programs such as the Tribal Historic Preservation Office, Ah-Tah-Thi-Ki Museum, the Ahfachkee School and numerous language and culture programs.